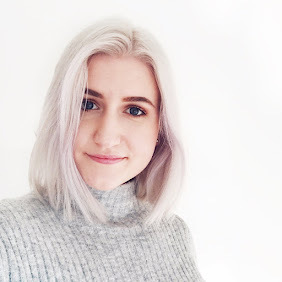 I'm a big perfume gal and although I don't have a huge stash, I stay quite loyal to fragrances I like (looks over at third bottle of Jo Malone Blackberry & Bay Cologne). Recently I've opted out of the more "mainstream" fragrances I pined over in my teens, like YSL, Viktor & Rolf, etc. and decided to try out a few from brands I hadn't tried yet. Yes, I'm aware that everyone and their mum has probably tried a Diptyque fragrance, but they're expensive so I did what every poor adult does and waited until Christmas to very (un)subtly send people links. I digress! 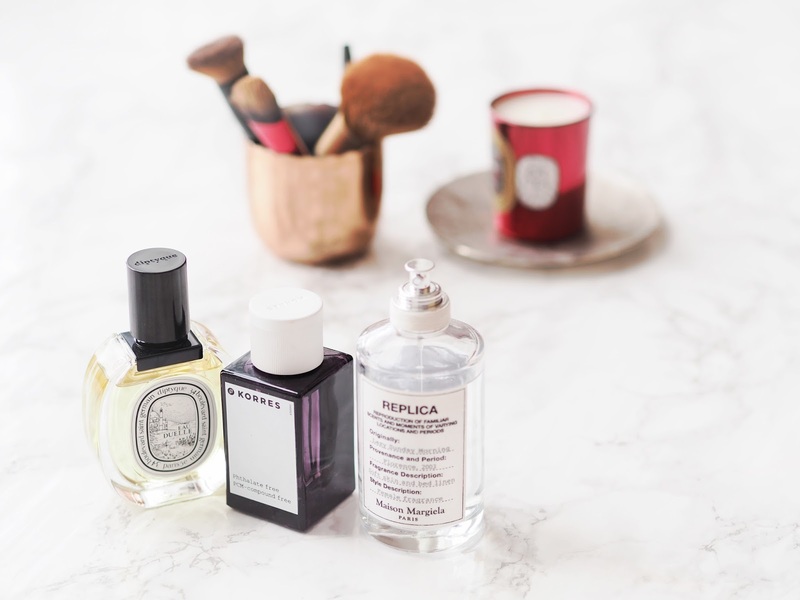 Here's a little roundup of three fragrances I've been rotating and liking a whole lot lately! Diptyque Eau Duelle Eau de Toilette - I've been rationing out little samples of this since about 2015. I absolutely love this scent, but as discussed, the price stopped me from buying it. This was a Christmas gift last year (aka. a mere month or so ago) and I've already worn it so much! According to the Diptyque website, this has notes of vanilla, spices and frankincense. It's basically a really warm and slightly musky vanilla scent, but not too sweet. It retains that vanilla-y element whilst still resembling a "grown up" fragrance. Isn't that what we all want? To smell like vanilla but in an grown up way? Korres Paeonia Vanilla Amber Pear Eau de Toilette - I have these next to me as I'm writing this so I've just given this one a sniff. When I was in the shop I smelt it and practically ran to the checkout counter, I remembered a sweet (but still grown up!) scent with a considerable amber note. Spraying this perfume on at home it smelled sweeter than I remembered and reminded me of something and I've just now been able to put my finger on it. Impulse body spray! Anyone remember that? I have, of course, made this perfume sound like a horrifically overpriced body deodorant but I promise it's far better than it sounds. It is sweet, yes, but the notes of peony, vanilla, amber and pear blend together to create a lovely scent. I also think this would actually be quite nice layered over something a little more dry (aka, less sweet). Actually: just tried it, can confirm, would recommend. Maison Margiela Replica Lazy Sunday Morning - Fragrantica describes this as floral woody musk fragrance with top notes of aldehydes, pear and lily-of-the-valley (thanks Fragrantica!). I don't know how to describe this scent at all, as I really don't have anything like it. Replica fragrances are so special and unique that you kind of have to go and give them a sniff to understand what everyone's going on about. This is the one out of the three that I've had the longest and ergo worn the most. It was also a gift (suggested by myself) and I know it's very expensive but you do get a lot and in my opinion, they're quite unlike a lot of other scents on the market! 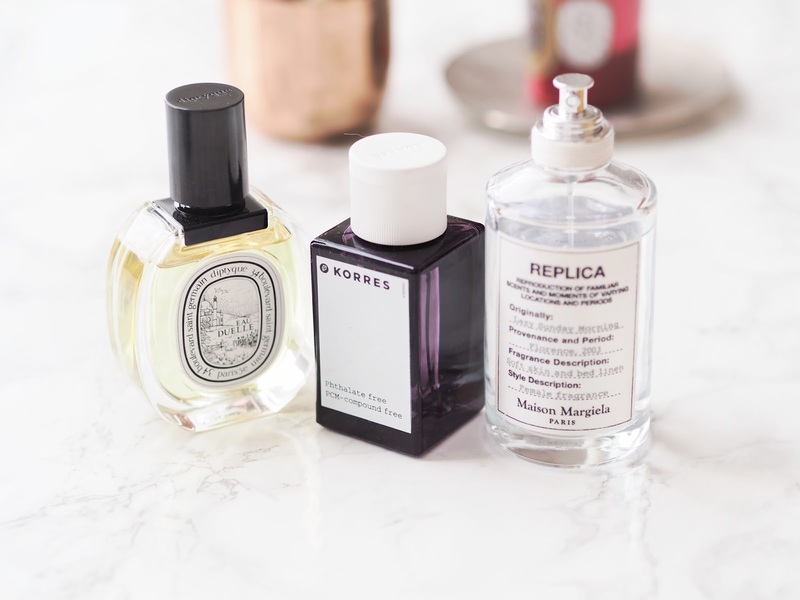 I don't write about perfumes a whole lot on the blog, purely because I don't buy many new ones, but these three are definitely worth checking out if you're in the market for a new scent! I tend to spend absolutely ages at counters sniffing perfumes, scented paper strips in one hand and a cup of coffee beans in the other - basically it's serious business. At the end of the day, you do want to end up with something you love and wear a lot, considering how pricey perfume is in general, so I'd definitely have a sniff in store before purchasing a scent! Either that or just keep oh so casually sending those links! Yes to all of these!! Eau Duelle smells incredible and I'm highly debating on picking that up - 8 have Philosykos and Roses and looove those. I also picked up a mini holiday set which had Do Son which also smells incredible. For years I rotated between my Marc by Marc Jacobs and Chloe EDP - and while those will probably always remain favorites, I'm excited to be branching out a bit more. You sold me on the Korres one - it sounds amazing!! Hoping I come across it in stores one day so I can give it a sniff.